A major part of NICRA's Trade Show and Convention is the National Ice Cream Clinic and Best Flavor competitions. The following members were awarded prizes for making the best ice cream in their particular categories. Each year, members of the National Ice Cream Retailers Association, who make their own ice cream, submit samples of their ice cream to a professor of dairy science, prior to the Annual Convention, to be analyzed and compared to ice cream standards. This year Dr. Tonya Schoenfuss, University of Minnesota, St. Paul, Minnesota analyzed samples of vanilla, and chocolate ice cream submitted by members of the association. A total of 26 vanilla samples and 23 chocolate samples were submitted. The following winners received their certificates at the Association’s awards banquet in November 2018. The Grand Master Ice Cream Maker Award started at the 2012 convention. In order to qualify for this prestigious award, a company must win blue ribbons in the Ice Cream Clinic at three different conventions within a five year period, starting in 2012. This year, three ice cream makers qualified for this prestigous award. “Country Berries” Ice Cream was named the Best New Flavor at the 2018 National Ice Cream Retailers Association Annual Meeting. The Best New Flavor contest is held each year in conjunction with the Ice Cream Clinic at the annual meeting. The ice cream was formulated and produced by Homestead Creamery based out of Wirtz,Virginia. The company won the coveted First Place for its new flavor. A total of 41 new flavors were submitted by NICRA member companies. Each flavor is sampled by convention attendees and a vote is taken by ballot at the meeting. The winner was announced during the annual banquet at the end of the meeting. With non-dairy flavors and formulations becoming so popular in the frozen dessert industry, the Best New Flavor competition had a secondary category this year. In the Best New Flavor Non-Dairy category, Chocolate Coconut Fudge was named the Best New Flavor Non-Dairy made by Clementine’s Creamery based in St Louis MO. 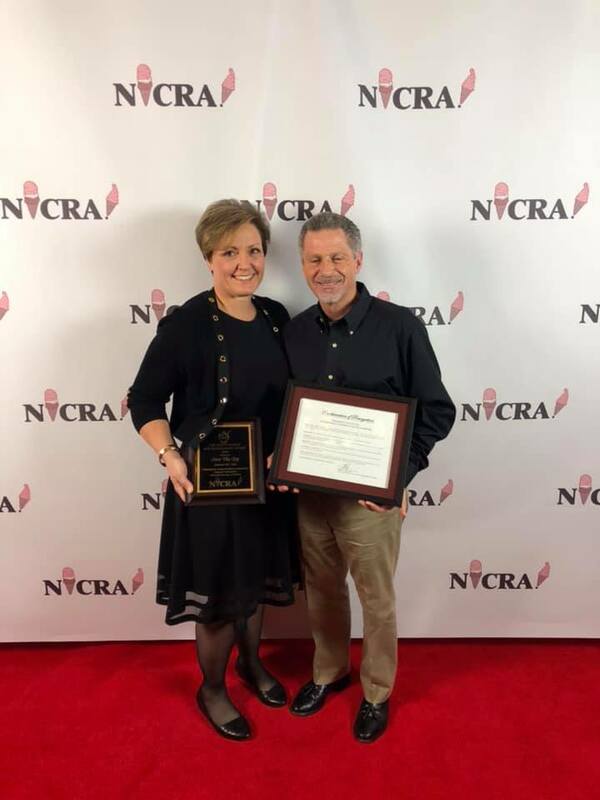 Lynda Utterback served at the executive director for the NICRA organization from the year 2000 to 2018 and administered the organization for 17 years. Lynda came into the executive director role when the Association had a great need for better administration and controls, and her experience with the ice cream industry and publishing the National Dipper became a perfect match. During Lynda’s time as Exec Dir, the association stabilized structurally and financially and a solid foundation was established to future growth.